And essays. Which is why I love anthologies. The first anthology in which I was published was Circling Faith: Southern Women on Spirituality (University of Alabama press 2012). The editors were Jennifer Horne and Wendy Reed. 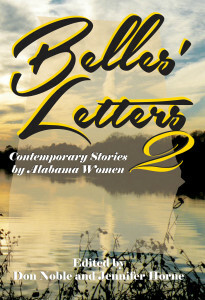 And now Jennifer has just edited (with her husband Don Noble) a collection of short stories (these are all fiction) by 37 Alabama women writers called Belles’ Letters II (Livingston Press: The University of West Alabama). Belles’ Letters I was published in 1999. Jennifer and Wendy as contributors. I couldn’t be more proud of this book, and of them. Or more thankful for our friendship. We spent the weekend talking shop over coffee at Wendy’s kitchen table, another visit around Jennifer’s table, and a stroll in her backyard overlooking a lake in Tuscaloosa, drinks and dinner at local bars and restaurants, and I returned to Memphis on Sunday feeling revived. Back home today I am diving into this new collection with much appetite and enjoyment. It’s fun to read stories by three of the contributors to A Second Blooming and six contributors to Southern Writers on Writing, the anthology I’m currently editing (coming from University Press of Mississippi in 2018). It’s so encouraging to see all these gifted writers taking time to contribute short pieces to anthologies. As Madeleine L’Engle said, “We all feed the lake.” And these authors are feeding an important lake—one that I believe will become historic. A lake filling regularly with contemporary Southern literature. Anthologies aren’t just for breakfast any more. They aren’t just something to keep on a table in the living room and pick up when you only have a few minutes to read and don’t want to dive into a longer book. They can be as satisfying as any main course. As I was beginning to read from Belles’ Letters today, I found that it didn’t matter that the stories weren’t connected. That they didn’t have a theme. 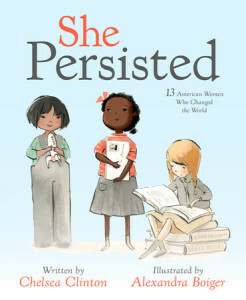 It only mattered that they were well written, excellent samples of the fine craft readers have come to expect from such authors as Pulitzer Prize winner Shirley Ann Grau, Harper Lee Award winners Fannie Flagg, Carolyn Haines, and Sena Jeter Neslund, and best-selling authors such as Gail Godwin, and Lee Smith. Each story left me wanting more—and scrolling down the table of contents like a kid in a candy store, selecting my next treat. 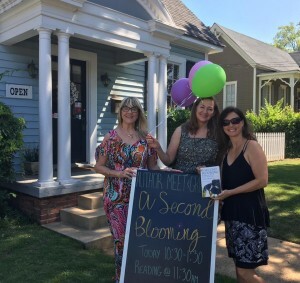 My spring/early summer book tour is over, and I’ve got about six weeks to regroup before events for Cherry Bomb (my novel) start up on August 8. I had initially planned to get lots of words on the page for my new novel during this break from marketing, and maybe I will, but for now I’m content to slow down and read. To refuel. I couldn’t be happier with my “to read” stack in my office. 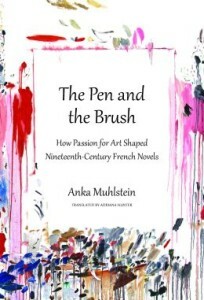 I added another interesting book to the pile, another one I picked up at Ernest & Hadley this weekend: The Pen and the Brush: How Passion for Art Shaped Nineteen-Century French Novels by Anka Muhlstein (translated from French by Adriana Hunter). Meanwhile, I’ll get back to my stories. And I don’t mean soap operas.